Pier 7 Marina offers heated indoor, cold indoor, and outside winter storage. 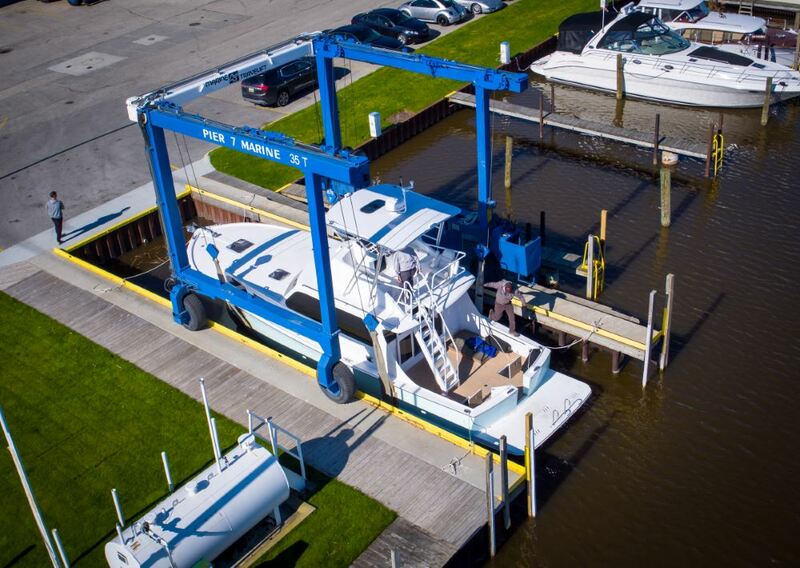 With our 35 ton Marine Travelift, Pier 7 marina can haul boats to 70’ in length, 18’2” wide, and 13’ draft. This is the largest liftwell in central Lake Huron. We utilize industry leading boat handling equipment, with knowledgeable and experienced operators. Your investment is in the best hands at Pier 7 Marina. Buildings A, B and C are a combined 40,000 square feet of indoor heated storage. Buildings D, E and F are a combined 20,000 square feet of indoor cold storage. Both heated and indoor cold buildings have power and are lighted for your convenience. We also have asphalt and gravel outdoor storage areas. All outdoor storage areas have power and water nearby. There is room for over 250 boats. All Winter Storage Rates include Haul-Out, Bottom Wash, Blocks and Stands, and Launch. There is 7 day access to the storage buildings during the winter months, making it convenient to get your boat in ship shape for spring launch. There is also no need to set a mandatory launch date when your boat is hauled out, simply call us when you’re ready and the weather permits. We offer a 10% discount for winter storage paid in full by September 30th, 2018. Thank you for your interest in winter storage at Pier 7 Marina. Our staff will review your request and contact you shortly to confirm availability. If you are in need of immediate assistance, please call us at 989-894-9061.